The Lease Default Letter is recommended for Tenants, although may be used by Landlords as well, if the other party is breaching a section or clause in their lease agreement. The reason it is recommended for Tenants is most States have laws for landlords on how to handle specific violations against the Tenant (See Eviction Notices). After completing this letter should be sent via Certified Mail (with return receipt) as this will prove that they received the notice of default. Default Due to Late Rent – For Landlords, the Notice to Quit for Non-Payment should be used rather than this default letter if the Tenant is late on their rent. Default Due to Non-Compliance – For Landlords, the Notice to Quit for Non-Compliance should be used rather than this default letter of the Tenant is violating their lease. You may obtain this letter as an Adobe PDF, Microsoft Word (.docx), or Open Document Text (.odt) file by selecting the links in this statement or the appropriate button beneath the preview image on this page. Utilize the blank lines labeled “City,” “State,” and “Zip” to continue this report by entering the City, State, and Zip Code where the Premises is located as it appears on the Lease. Report the Full Name of the intended Recipient precisely as it appears on the Lease in Default on the empty line following the word “Dear.” If the Lease reports a specific Title associated with this individual, make sure to include this. Most Lease Agreements can be Identified through the Premises being Leased, the Parties involved, and the Lease Date (i.e. Date of Execution, Signature Date). 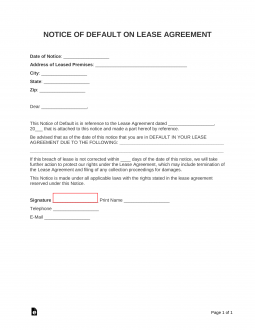 Document the Lease Date using the two blank spaces in the first statement. Enter the Month and Calendar Day of the Lease on the first blank line and the Year of the Lease Date on the second blank line. It is imperative, to the Purpose of this document, to give the Number of Days from the Official Date of the Notice the Recipient must correct the Lease Violation causing the Default. In many instances, the Local, State, and/or Federal Government may have some specific Time Frames which must be obeyed. Make sure you are in compliance with any such statutes, then enter the Maximum Number of Days the Recipient has to correct the violation on the blank line in the statement beginning with “If This Breach Of Lease Is Not Corrected Within.” Make sure this is a Number. That is, if a Week’s Notice is being given, write in the Number “7” (not “1 Week”). In order for this letter to be taken seriously, the Issuing Party must Sign and Print his or her Name onto he blank lines labeled “Signature” and “Print Name” near the bottom of this letter. Below the Signature Line, the Issuing Party must also provide some contact information. Enter the Telephone Number and E-Mail Address where the Signature Party may be reliably reached.